Downtown Seattle, it seems, is a mecca for free concerts in the summertime, and as summer slowly but surely comes to an end, API Food Fight Club has decided to close August out with a bang with one of the most impressive free shows we’ve seen all year. On Sunday, August 28th, the street between Jackson and King Street will be turned into a colorful dance party of epic proportions. Hosted by Hollis Wong-Wear of The Flavr Blue, the festival will feature a wide array of musical performers that push the boundaries of their genres, all for free, from 3:00 to 9:00 P.M. The all-day event will certainly be one to remember, not least because New Yorkian alternative rapper Awkwafina will be making her Seattle debut as part of the Block Party. On top of her much-anticipated performance, you can also show up and see jazz rap heavyweight Kero One, pop music eccentric and live mashup legend Shawn Wasabi, Seattle’s Tomo Nakayama (of Grand Hallway, among many other accomplishments), and others. Did we mention it’s free? 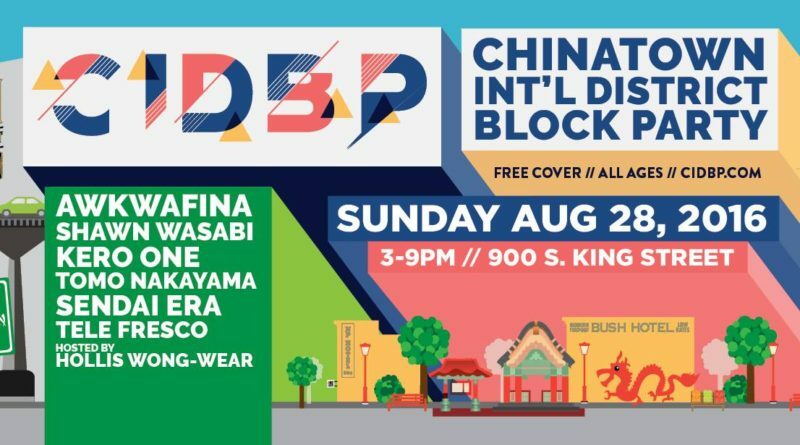 A huge incentive of the inaugural block party is to highlight the creative talents of Asian Pacific Islanders, by means of a festival completely organized and ran by Asian Pacific Islanders. Needless to say, this isn’t an event you should skip out on. For more information on the even itself, consult its Facebook event page or the block party’s official website, cidblockparty.com.